Some time ago when my eldest child was still a preschooler, we were invited to a friend’s house for dinner. Another couple brought in the vegetable dish they had made to contribute to the dinner. It was the first time I had tasted spaghetti squash and I was instantly hooked to its delicious taste and noodle-like texture. I decided to come home and try my hand at this dish. I found it extremely easy to whip up at dinnertime, so wanted to share it! A delightful vegan, dairy-free, egg-free, gluten-free vegetable side dish that forms the perfect accompaniment to the main course. While the squash is being cooked in the pot of water, heat a 1/2 tablespoon of olive oil in a separate large saucepan. Once hot, throw in the minced garlic to fry. When the garlic pieces are browned, remove the toasted chopped garlic to set aside in a bowl. Using the same saucepan, add another 1/2 tablespoon of olive oil into the pan. Then put the frozen corn to cook on a low-medium fire stove setting. Cook the corn until it is golden and toasted (takes approximately 10-15 minutes), stirring occasionally. Once toasted, remove the corn kernels into the same bowl with the garlic. When the spaghetti squash is cooked through, remove it carefully from the pot and let is cool/drain in a colander. Then cut the spaghetti squash in half and remove the inner strand-like flesh with a fork into a large bowl. Next, put a half tablespoon of olive oil into the saucepan. Once the oil is heated, put the shredded cooked spaghetti squash into the saucepan, and add the salt, pepper and garlic powder seasoning. with the corn and then add back in the toasted garlic. Add the salt, ground black pepper and garlic powder and mix the seasonings well into the spaghetti squash strands. 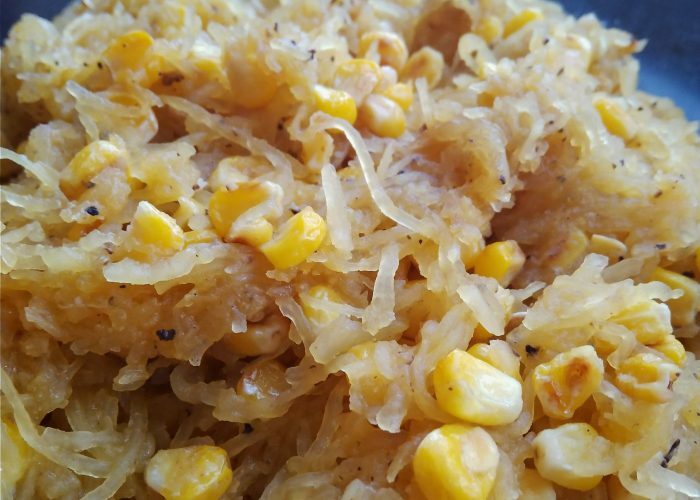 After a few minutes, when the spaghetti squash is heated through, add back in the toasted garlic and corn kernels. Stir well together. Taste and adjust seasonings, and add in additional ingredients as desired. Serve warm! If you like, towards the end of the cooking process you can add in a tablespoon of coconut oil or vegan margarine for a more buttery feel and texture. Feel free to also add in another protein-rich source like toasted pine nuts, cooked black beans or roasted pumpkin seeds/sunflower seeds. Sprinkle some vegan 'cheese' shreds on top for a finishing touch! It is surprisingly how filling this can be as a side to a meatless dinner! My eldest child loved this paired with mashed potatoes. I’m sure you could also just combine the strands of spaghetti squash into mashed potatoes as you are mixing it. However, it also works great separately as you can come up with all sorts of fun creations which are sure to appeal to little ones. My then nearly 4 year old loved having a monkey face on her plate using yellow spaghetti squash ‘hair’ and a white mashed potato ‘face’. If you don’t know what I mean, check out the image on my Instagram account dietitian_mom!